Check the measurements you will need before you begin your calculations. A calculator is useful. NOTE: we have simplified the fabric quantity formulas to make it easy to work on your calculator by using the following symbols: + (plus) and x (times). On plain fabric this is the width minus seam allowances (allow approximately 1.5cm (1/2in) seam allowance on each side) On patterned fabric, match the pattern first at the sides. For the repeat, measure from point to point where the motif for pattern starts again. 4 Fabric cut drop: On plain fabric work out the finished length of the curtain from your window measurements + heading and hem allowances. See chart below. On patterned fabric take the fabric cut drop and divide by the pattern repeat. Round up, never round down, and multiply the result by the amount of the pattern repeat. For a drop pattern see p119. This FABRIC QUANTITIES table will show you how to find the exact quantities you need for the Almost Instant Formula, above. The fullness ratio gives you the number of widths, add the allowances to the length of each panel. On machine gathered tapes the fullness ratio can be flexible as the draw cords are pulled up to the required measurement. Even if a finished heading has slightly less than 2 x fullness, it will look attractive. Here the fullness is more critical as it dictates the size of the pleats and spaces. With less than 2 x fullness, spaces will be wider than pleats, and the curtain will look skimpy. Especially on patterned fabrics, allow plenty of fullness so the pleats can be positioned over a particular area, see p140 in The Encyclopaedia of curtains. A standard allowance for machine tape and hand sewn pleats Is 6cm (2in). For frilled, puffed, slotted and other decorative headings, see individual suggestions pp 134-148 in The Encyclopaedia of Curtains. 1 Finished width of valance - that is, the measurement around pelmet board or valance rail including sides. 3 Usable width of the fabric. A graceful proportion is for the shortest and longest measurements to be 1/6 and 1/5 respectively of the finished curtain length. Calculate the fabric quantities as for a straight valance based on the longest measurement. Cut drop = deepest measurement of valance + a heading and hem allowance. Adjust the cut drop for pattern repeats if necessary. The finished width of a flat pelmet is the measurement around the pelmet board or rails including the sides. Divide this figure by the usable width of the fabric to establish the number of widths you will need. Cut drop = deepest measurement of pelmet + 15cm (6in) turning allowance. For estimating quantities, see p166 and p182 respectively in The Encyclopaedia of Curtains. 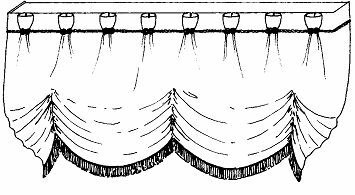 For contrast edging, frills and fabric trims, see Individual instructions in Finishing Touches pp l50-65 in The Encyclopaedia of Curtains. These apparently minor quantities will add up to more yardage than you imagine; never assume you will be able to find enough from leftover fabric. For piping and binding cut on the cross, see pl21 in The Encyclopaedia of Curtains. These are estimated in the same way as window curtains. For specific details, see p213 in The Encyclopaedia of Curtains. For round tablecloths, see p218 in The Encyclopaedia of Curtains. Obviously there will be some wastage with round cloths, but you can use the corners for the smaller fabric trims, applique on cushions and so on. Will need only the flat measurement across the window, see ppl99-200 in The Encyclopaedia of Curtains. Vary in fullness from 1.5  2.5 according to the heading required. They are usually made a little overlong so that you can have pretty scalloped hems even when they are dropped down. As above, but they also have extra vertical fullness; for more details see pp203-4 in The Encyclopaedia of Curtains.